You board the Jungfrau Bus at Zurich Airport or Zurich main station, which takes you quickly and comfortably to Grindelwald. Explore the Jungfrau Region and visit the Jungfraujoch – Top of Europe, the best place in Europe to discover a world of snow and ice. Enjoy breathtaking views of the Aletsch Glacier, the longest glacier in the Alps. Overnights in Grindelwald. 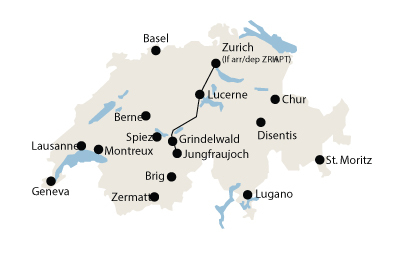 Return to Zurich Airport by train or continue your stay in Switzerland at your own request.